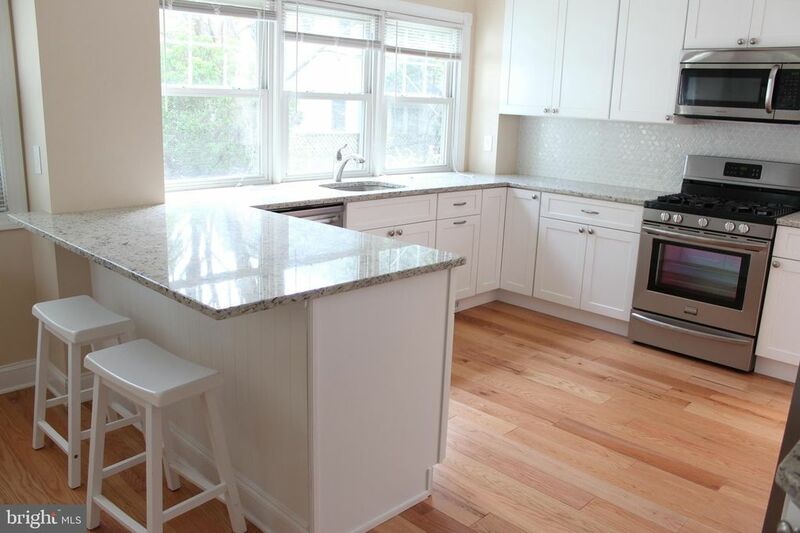 You'll love the NEW Kitchen and gleaming refinished wood floors in this charming 3-5 BD, 1.5 BA rental home, which is within walking distance of Rosemont Train Station, shops, restaurants, movies, and Bryn Mawr Hospital. Recently renovated, this home has fresh paint, refinished wood floors, and a white Kitchen with granite counters, stainless appliances, tiled back-splash, and breakfast bar seating. The charming Living Room has a fireplace, diamond-paned windows, and a staircase with great millwork. The spacious Dining Room has a bay window as well as a deep Greenhouse window. Upstairs is a Master BD with an attached BD which has been converted to a Closet, 2nd BD, and a Hall BA. An arched doorway leads to a wonderful upstairs Family Room (or add'l BD) with a distinctive tiled fireplace and large windows. Another BD and large Storage Room/Closet are located on the 3rd Floor. Highly-ranked Radnor Twp. schools. Newer Gas Heat & Central A/C. Washer/Dryer are in the spacious, dry Basement. Ample storage abounds in the basement and in the walk-up, floored storage room over the 1-car Garage. Outside, you'll enjoy a private, grassy rear yard, the covered front porch with charming swing, and a Radnor Township playground which is located right next door! Easy to show - schedule your appt. today!